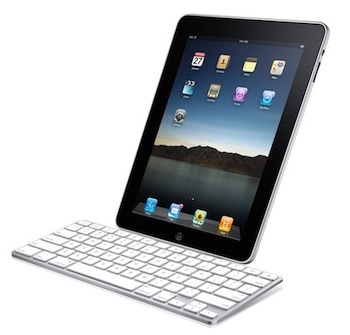 A notable lack on Apple's accessory page for the iPad 2 is the Keyboard Dock the company used to sell last year for the original iPad which allowed you to dock the device, charge it, and type with a physical keyboard at the same time. I own a 2010 Keyboard Dock and, in spite of its portrait-only functionality, it is a well-made piece of tech that I used a lot last summer when I needed to write my articles on the go. Keyboard Dock is no more. Apple isn't selling such an accessory for the iPad 2 (they only have a new dock for sale), and AppAdvice reports the dock you bought last year won't work with the iPad 2: it doesn't fit well and doesn't charge the device. The decision doesn't come as a surprise considering Apple's rapid move to touch interfaces instead of physical keyboard input. Clearly, Apple thinks the iPad's virtual keyboard is great for most of the typing you'll need to do, and if you really want a physical keyboard you can still get one of the third-party ones that will come out in the next weeks -- or just buy an Apple Bluetooth wireless keyboard that works perfectly with the iPad. But that is, no native option for the iPad 2. Update: we're hearing from some of our readers that the Keyboard Dock typing works, but the iPad 2 doesn't indeed fit very well and charging is rather random. Works for some, doesn't do anything for others. We'll look into this.Update #2: Reader Jason Duke sent us a video showing that the Keyboard Dock works with the iPad 2; typing works just fine.